I can't believe that the weather forecast for this Saturday is for brilliant sunshine with temperatures that could include outdoor sketching. Let's visit the Hamilton Grange National Memorial, also known as The Grange or the Hamilton Grange Mansion. Alexander Hamilton created the tools for the success of the United States. From his humble beginnings as an orphan on the Caribbean island of Nevis, he became George Washington's right-hand man, and eventually our Treasurey Secretary. Where: Hamilton Grange is located within New York City's Saint Nicholas Park in Manhattan. The street address is 414 West 141st Street, and it sits between Convent Avenue and St. Nicholas Avenue. When: Meet at 11 AM. If you need to come later - we'll be there. * Take the #1 train to the West 137th Street stop on Broadway. Go North to 141st Street and make a right. Walk East towards Hamilton Terrace. 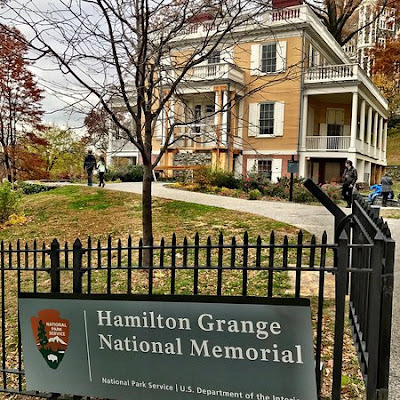 The Grange is located at the intersection of West 141st Street and Hamilton Terrace. * Take the A, B, C, or D train to the West 145th Street stop on St. Nicholas Avenue. Go south to 141st Street.Make a right onto 141st Street. Go west one block to Hamilton Terrace. Be sure the confirm subways are running. Show and Tell: 3 PM - A short walk to The Grange Bar and Eatery, 1635 Amsterdam Ave (b/t 140th St & 141st St) Phone (212) 491-1635, where we will share drawings, good stories and snack, beer or wine if you're so inclined.